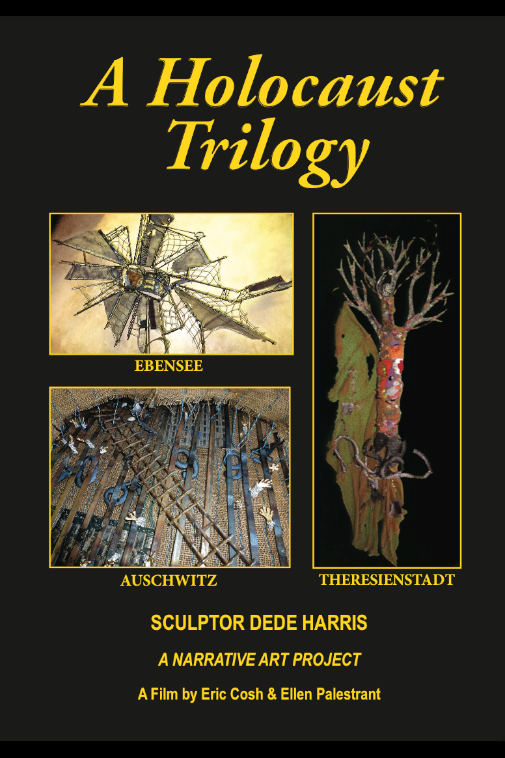 Eric Cosh and I are pleased to announce that the DVD we produced of Narrative Artist Dede Harris’ work, A HOLOCAUST TRILOGY, is now available. When Eric and I first saw Dede sculptures depicting three different concentration camps, EBENSEE, AUSCHWITZ and THERESIENSTADT and then read the three accompanying books, we immediately knew that we wanted to make a film about both her emotive, powerful art and her deeply committed creative processes. Dede Harris, who is the wife of Holocaust Survivor, Sam Harris, and a docent at the Illinois Holocaust Museum and Learning Center, has an extensive knowledge of the Holocaust. She brings this understanding and her deep feelings about the sufferings of the prisoners and the millions who died, into her work. Her thoughtful, heart-felt, and articulate explanations of the concentration camps and the choices she made in creating the sculptures, are profoundly moving. We also gain an education. It is fascinating to hear Dede explain just what she hoped to achieve in these three sculptures and how she went in search of every element that she eventually incorporate into her artistic visions. I believe we captured a profound and visionary artist in our film. Viewers will gain a deeper understanding of these horrific concentration camps, and, also, gain an insight into the commitment of a true artist. Dede Harris’ unrelenting determination to find just the right materials for her sculptures, her noteworthy artistic skills and her tenacity in bringing these works to completion, is truly remarkable. These three sculptures of Ebensee, Auschwitz and Theresienstadt are now on permanent exhibition at the Illinois Holocaust Museum and Learning Center. Thank you Doris, for your kind remarks. I know you are very involved in Holocaust education and it means so much to me that you found my art meaningful. Thank you for taking the time to watch the video, think about my art and then write a comment. Unfortunately I have not yet seen your sculptures on display but, I watched your marvelous video. It was moving to listen to your explanation of the materials with which you chose to represent life in the horrific concentration camps. I was especially moved to tears to see the pleading hands. Every detail was so carefully selected. Through your art, generations will better understand and feel your message because you were able to harmonize artistry with soul. Knowing how passionate you are about art, I am deeply touched that you found my art to be so moving.